Web designing is obviously an integral part of IT industry that deals about designing identity for the online community (World Wide Web users). In today’s era where the internet plays an essential role in businesses, demand for high-level of creative minds as well as perfection has increased tremendously.The career scope of web designers is increasing rapidly and the hunt of efficient developers who can create professional websites is at the peak. What does Web Designing deals with? Web Designing is certainly a promising career that has the immense scope of opportunities for interested professionals. Business people who are interested in making their online presence usually approach web designing giants to craft their websites. Therefore, web designing has immense opportunities in establishing their career because software companies recruit professionals who are qualified in web design and development technologies. Besides, many corporates employ web designers for internal projects so there is great scope for the designers to interact with such major companies that run small initiatives. Additionally, web designers are also in great demand in the media industries such as news, advertising agencies and also the education field. Wed Designer Freelancer – If you are having a good understanding of web designing skills then you may start your career as a freelancer. When you work as a freelancer there is no needed for office or scheduled time, so you can work with your comfort time. You can take projects from self-visit to client’s office offline or get projects from online bidding websites like UpWork, Elance, people per hour, Freelancer, etc. Web Designing Company – Yes, If you have mammoth experience in this field, you can begin your own web designing company by taking projects and hire your own team. 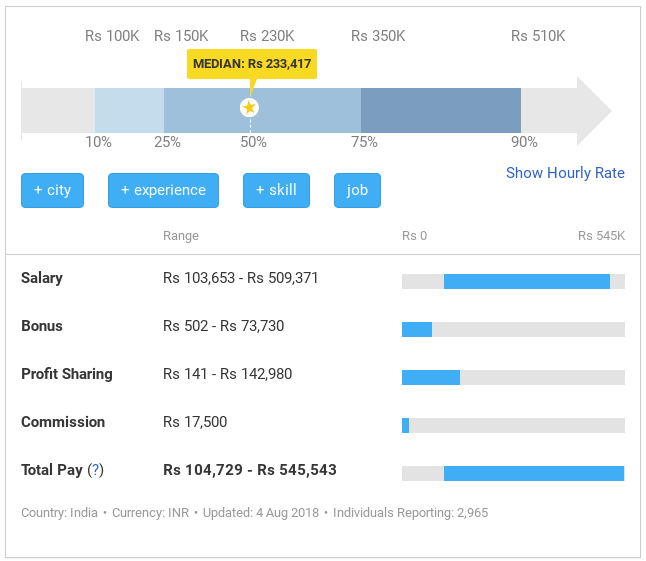 According to Payscale.com, the average pay for a web designer is INR 233,558 per year in India. And the experience strongly affects salary for this web designer jobs. In addition, the salary of a web designer will differ from company to company. It also depends on your skill-set and experience. Whether a web designer has excellent skills, their profile will be better and they will be stand out from the competition. Most companies possibly give INR 15,000 to INR 40,000 per month to the web designers. We all know that in upcoming years, more than 80 percent businesses in India and across the world be online. Now, most of the business make their space in the online world with their own domain name and website. With such huge career opportunities, it of no wonder that web designing professionals have the best career with a promising future roadmap. In India, web designing is one of the greatest industries and evolving day by day. There is an extensive opportunity to pursue a good career in IT or the software industry. So, there is lot’s of web designing companies are available in every small & large city of India. Your skills and creativity will define which company you want to choose to start your career in web designing. Nowadays, the technologies keep on varying and new techniques are emerging rapidly leading to changes in web designing concepts. In order to keep pace with current tools and techniques, it required being up-to-date with the same. Are you looking to learn the best-in-class web designing training in Chennai? Call us at +91 9884802333 or email us your requirements to info@webdesigningcourse.in. You may also get in touch with us via online chat. Web Designing Course in Chennai offers intensive learning on live projects for enhanced career! If you are interested in web designing and development then I would suggest you go ahead. It is one of the sectors that has a lot of scope for aspiring and passionate young minds who have talents and skills.